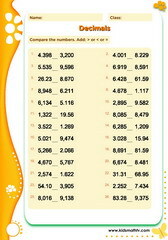 Addition of five place numbers activity sheet for fifth graders. 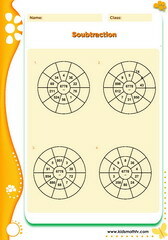 Learn addition with fun circle drills - Complete the puzzle. Addition table drill puzzle activity worksheet - complete the puzzle. Algebraic expressions worksheet e.g. finding missing numbers in expressions. Solve equations with defined and unknown variables with this worksheet. 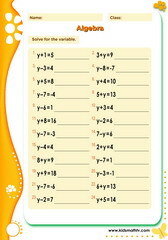 Pre-algebra, introducing basic algebra concepts of finding unknown variables in equations. Solve for unknown variables in equations e.g. y + 3 = 7, find 'y'. 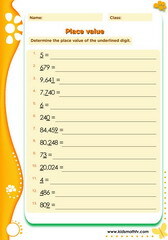 Add three decimals numbers e.g. 3.7 + 2.34 + 4.0 =. Addition of decimals in a circle drill puzzle, print & practice with this worksheet. 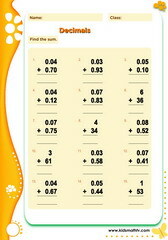 Addition of numbers with decimals activity worksheet. Practice how to compare decimal numbers up to thousands - pdf. 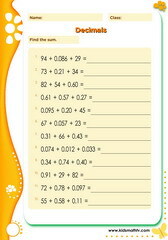 Learn how to convert decimals to fraction e.g. 0.5 = 1.2, 1/4 = 0.25 etc. 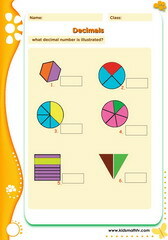 Learn about decimals with illustrated pictures of geometric shapes. Subtraction of decimals numbers in a circle drill - fun worksheet. 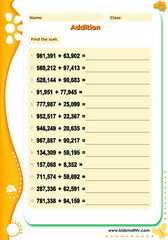 Learn about subtracting decimals e.g. 23.45 - 21.56 = ?. Division of numbers ending in zero by 10 e.g. 100 divided 10 etc . 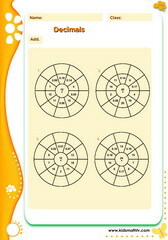 Division of numbers in a circle drill puzzle worksheet. 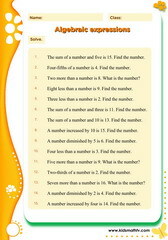 Solve basic division problems and match the answers on this worksheet. Division of two by one digit numbers activity e.g. 24 divided by 2. Division of numbers on a table drill puzzle worksheet. Long division of 1 and 2 digit numbers, many activities for kids to review. 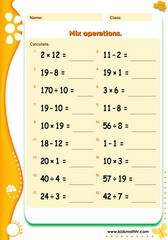 Learn how to add fractions e.g. solving 1/3 + 1/4 = ?. 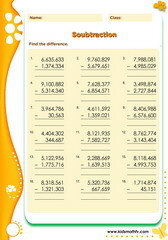 Comparison of fractions activities, >, <, = e.g. 1/2 > 1/6 etc. Converting fractions to decimals e.g. what is 1/3 in decimals ? Finding and completing equivalent fractions activity worksheet. Finding fraction or portions of circles worksheet, 1/2, 1/3 etc. 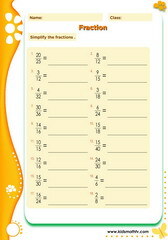 Calculating fraction of numbers worksheet e.g. 1/4 of 160 = ?. How to subtract fractions - Math problems for reviewing fractions. Multiplying two fractions, follow the rules of multiplication of fractions. 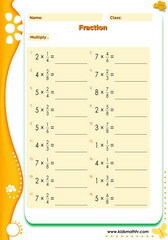 Multiplying fractions by whole numbers worksheet e.g 4 x 1/8 = ?. 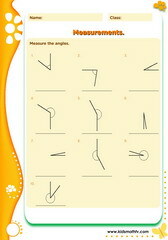 Simplification of fractions to their lowest terms, e.g. 25/100 = ?, 15/20 = ?. Finding the area of circles worksheet, print and learn geometry. Finding the circumference of circles using the formula - pdf printable. 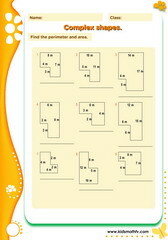 Finding the perimeter and area of complex figures worksheet, L & M -shaped. Finding both the perimeter and area of rectangles math worksheet. Finding the unknown sides or vertices or polygons, get more practice on geometry. Identifying key geometric shapes in math - activity for revising. Finding shapes that have symmetry or which are assymetrical worksheet. 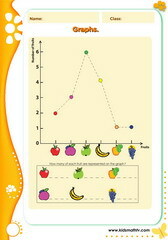 Bar graphs and linear graphs, representing and interpreting information visually. Coordinate graphs, finding x,y - pairs and points on graphs worksheet. 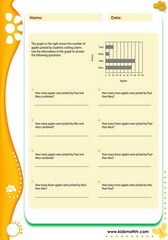 Blank graph for practicing data representation, flexible worksheet for classrooms. 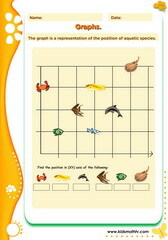 Obtaining information and representing them on graphs, worksheet introducing statistics. Graphs that teach kids to locate in (x,y) coordinates, finding point with references etc . Plotting information on linear graphs, finding trends with data. Data representation and interpretation on tables (or in tabular forms). 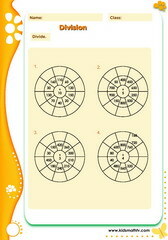 Sets & Venn diagrams worksheet, finding elements in universal sets, intersection, union etc. Finding data on Venn diagrams, union sets, complements, intersections etc. X Y coordinate graphs - Finding objects on a graph using coordinates. Practice converting scales e.g. cm to mm, yards to feet & vice versa. Measuring angles on geometric figures, finding missing values. 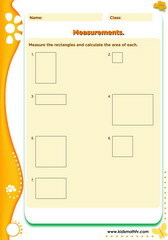 Measure dimensions of rectangles and calculate the surface area of such shapes worksheet. 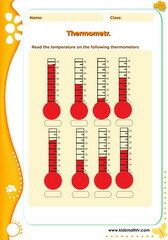 Reading measurements on a thermometer in degrees Celsius. Mixed operations & exercises, addition, subtraction, multiplication worksheet. Test and review all skills in 4th grade math on adding, multiplying, subtracting. 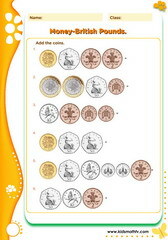 Addition of coins, specifically British Pounds math worksheet. 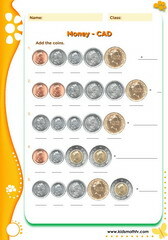 Review addition of coins in Canadian dollars, $ 4 + 5 = ?, cents, dime etc worksheet. 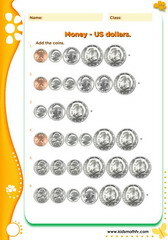 Learn how to add Euro coins, learn about recognizing & using money with this worksheet. 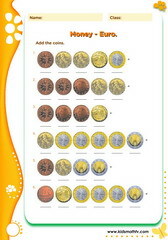 Addition of money - US dollar coins, cents, dime, quarter, worksheet. Using pictures of US dollar coins, practice adding money and finding sums. 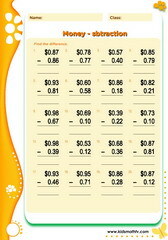 Money addition exercise for children - start learning how to shop. 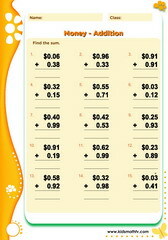 Money subtraction exercise (US $) - learn how to spend money and get a balance, worksheet. 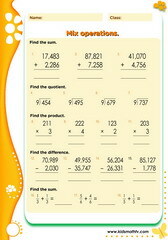 Introduction to basic multiplication concepts, 1 x 2 =, 3 x 4 = etc worksheet. 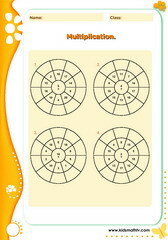 More multiplication activities on a circle drill puzzle worksheet. 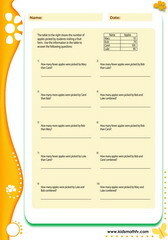 Start multiplying and matching answers in this exercise worksheet. 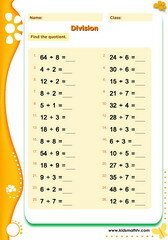 Practice Multiplication table drill with this worksheet. Practice multiplication of 2 by 2 place numbers e.g. 23 x 56 = ?. Review multiplying numbers by multiples of ten e.g. 234 x 10 = ?. Revise comparing numbers, greater than, less than, equal to worksheet. 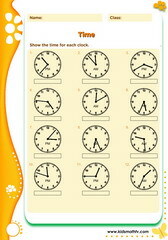 Counting following a given patterns, e.g. in twos, tens, etc worksheet. 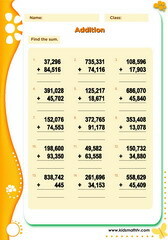 Finding the place value of numbers in other longer numbers activity sheet. 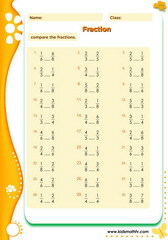 Identify and differentiate between prime and composite numbers with problems on this sheet. 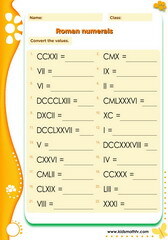 Converting between Roman and Arabic numerals from small to large numbers. 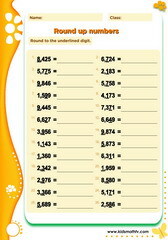 Round up numbers to the nearest one, ten, hundred, thousand etc get more practice. 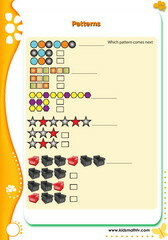 Learn to compare & contrast between different math patterns. Comparing different patterns and finding those that are similar patterns. 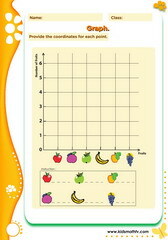 Growing patterns worksheet - Find the trend and see how patterns increase. 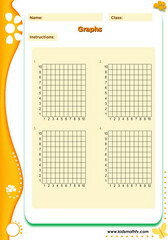 Growing patterns - Introduction to mathematical patterns using basic illustrations. Ordering numbers in terms of magnitude from large to small & vice versa. 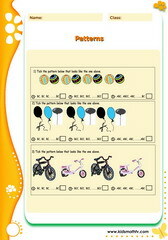 Finding math patterns activity worksheet for children. 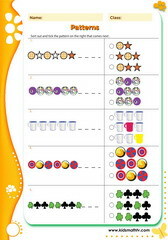 Practice math patterns of objects in real life and numbers in math. Learn how to complete patterns after studying how they progress. Finding the mode, median & mean - introduction to statistics with large data. 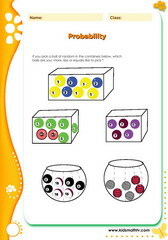 Learn probability and possible outcomes with balls in a box. 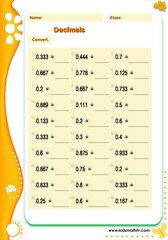 Find the probability (certain or unlikely) based on random occurrences. 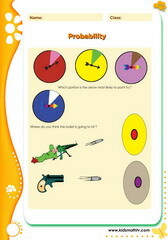 Probability activity illustrated with spinning wheels & targets. 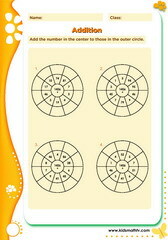 Subtraction of numbers in a circle drill, much fun with this puzzle worksheet. Basic subtraction aided by a table drill to increase the fun and excitement. 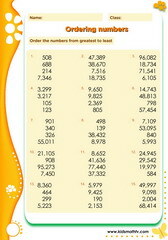 Subtraction of numbers right up to millions e.g. 3,500,975 - 2,670,000 = ? 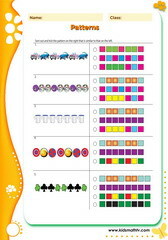 Review skills in subtraction with regrouping or carrying, learn to borrow across places. 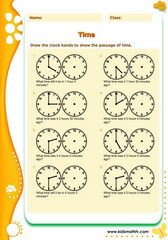 Practice telling time at am or pm - Read clock faces but also not day & night time differences. 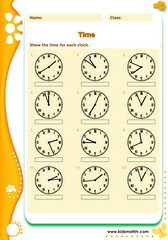 Reading time at specific hours or minutes past hours on clocks, applied time activity. 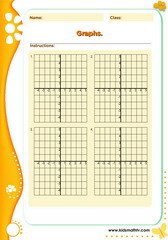 4th grade math worksheets pdf, on: addition, multiplication, geometry, money values, graphing, telling time, decimals, Roman and Arabic numerals, rounding up numbers, adding three numbers, finding variables in equations, algebraic expressions, logic, word problems, etc. Teachers and homeschooling moms can now supplement their courses with the free resources we offer on this page. Each worksheet has an answer key attached, hence making using them easy for tests or exams and homework. Print each pdf file or a number of them to make your own collection.